Philosophy of Care: Individual attention to patient’s problems. Availability to patient needs. Dr. Nagel is a graduate of the University of Pennsylvania School of Medicine. He has been practicing Gastroenterology in Barrington and McHenry since 1982. He completed his internal medicine training at the University of Minnesota, Minneapolis and served two years as Captain in the US Army stationed at Ft. Richardson in Anchorage, Alaska. He came to Chicago in 1980 and completed advanced training in Gastroenterology at the University of Illinois. 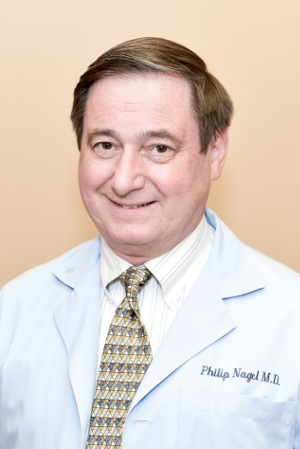 Dr. Nagel is both a Fellow of both The American College of Physicians and The American College of Gastroenterology. He has been on the faculty of The University of Illinois Medical Center since 1982 and is currently an Assistant Professor of clinical medicine at The University of Illinois Medical School. Dr. Nagel has been Chairman of the Department of Medicine at Advocate Good Shepherd Hospital and Chairman of the Medical Care Evaluation Committee. He is presently on the Executive Committee at that hospital and also serves as Chairman of Endoscopy at Good Shepherd Hospital. He also served on the Executive Committee at Northern Illinois Medical Center. Dr. Nagel has studied both violin and piano and enjoys long distance running. He is the father of 4 and enjoys spending time with his grandchildren.